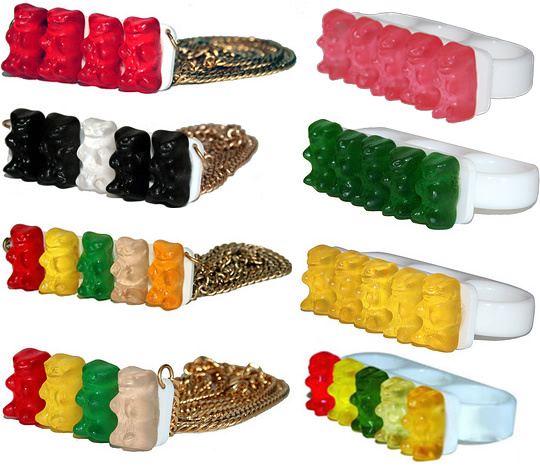 Here's a different way to get your bling on: ROMEingPANDA's gummy bear jewelry is finally on sale featuring a series of rings, necklaces, belts, bracelets, brooches, and pins, ranging from $100 to $160. Back in September we wrote about their sample jewelry made from actual, real gummy bears, but this is the official retail line that instead uses custom-molded lucite gummy bears. Rings come in two- or three-finger versions with various finger sizes, ensuring a good fit. 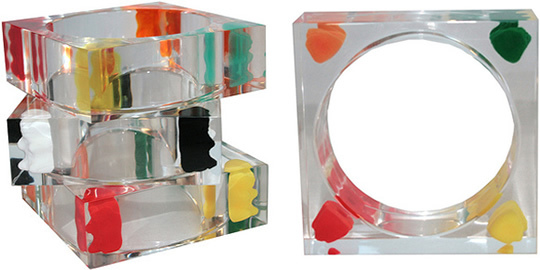 Of note is the rather fashionable clear lucite squared-shape bangle with four gummy bears embedded in each corner ($160), and the canvas belts with buckles made from either four or eight gummy bears encased in blocks of clear lucite ($125 or $150).